Next generation sound is here. Dennis Baxter Sound is leading with analysis and research of a range of convincing applications and practices for an array of content – music, sports and entertainment. The path forward is vastly important to achieving your vision and this is where we can assist you with everything from groundfloor planning to live execution. Through Dennis Baxter Sound, we've worked with international clients to develop and deploy next generation sound for live broadcast over multiple platforms. Immersive sound stands out in the toolbox of advanced audio production. At Dennis Baxter Sound, we understand what advanced audio production is and can help you achieve what enhanced audio production can be. The capture and creation of immersive sound is a new frontier and somewhat yet undefined for the production of media beyond cinematic releases. 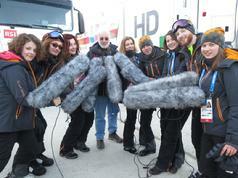 Music and video sound production is a wide open field of investigation for immersive sound capture and creation. Capturing and evaluating Ambisonics soundfields is a science that looks great on paper but clearly needs research and validation. Dennis Baxter Sound continues to make recordings and is developing a table of critical orders of Ambisonics that are necessary for a convincing articulation of specific sound reproductions. For example, sports may not require as high an order of ambisonic capture as a choir. Creating complex soundfields using spatial mixing tools is the progressive process of combining and mixing mono, stereo and multidimensional sound sources to create composite immersive soundfields. Dennis Baxter Sound is listening and evaluating sound samples at our studios which features a 11.1 Genelec mixing, mastering and listening environment. Because of the variety of reproduction devices and methods, the use of the height channels can vary greatly. There are no formulas here. Producing innovative content goes hand in hand with distribution and how to deliver your content to the widest range of listeners and viewers. There is no doubt that the boom in personalized sound will be from a broad catalog of content and a wide range of affordable reproduction opportunities. Let us help you reach your sound potential.